"Two Kozy Capes?!" or "What the heck is a Kozy Cape?" If you're the latter, you probably won't care to read the rest...for everyone else, this is how it happened. As ecstatic as I was to finally have a Kozy, I had become moderately obsessed with GIRLIE, pink-lovin, hair accessorizing kozys kozies Kozy Capes. Gillian was NOT that Kozy. Hm. Then, a month or so ago when I was poor as dirt and dreaming (delusionally) of a Parco, a bobbed Kozy popped up on BK. She was cheap. I mean, for a Kozy. You "What the heck is a Kozy" gang would still exclaim, "Wait, HOW MUCH?! ", but I didn't care. She was so CUTE! She was named Pocket, and she had her hair cut (which I liked and made me want her MORE) and her other flaw was that at some point her eye mech must have broken and it was replaced with an EBL eye mech. Like I cared! I'm no purist...but I was broke. Beyond broke. 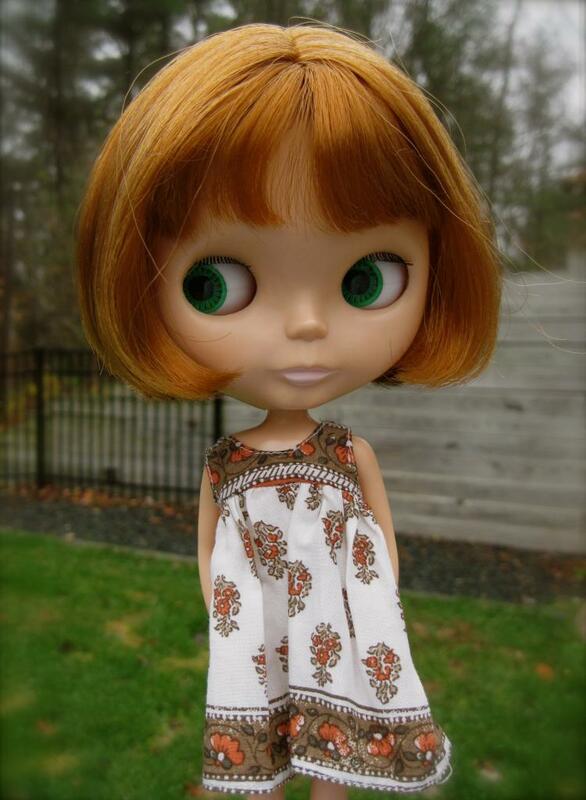 Like, I could not even so much as imagine how I could buy this doll. See how cuuuute? This was her first for sale pic. Warning, this is not my photo. If it's yours and you are mad, I will remove it! I started toying with the idea of selling ALL of my Blythe clothes. My girls would have been naked. All the shoes and boots too. Still no. I have my nice new Anniversary JerryBerry, so I could sell the basic one that I bought, right? 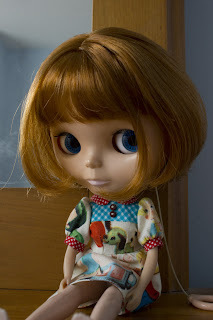 And maybe one or two of the lesser loved Blythe girls? No. Hm. I watched her Princess Needing Rescue thread obsessively until she was sold. I was so sad. I told myself it was just not meant to be. I mean, I never had a desire to have 'twins.' 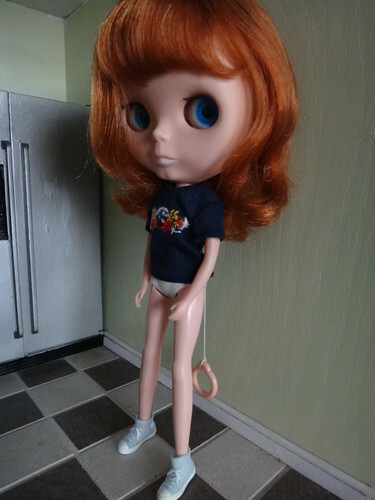 I thought it was such a strange idea; they are the same doll, what is the point in having two identical when there are so many different dolls out there??? Pocket wouldn't have been a twin. She would have been different. She has that bobbed haircut! 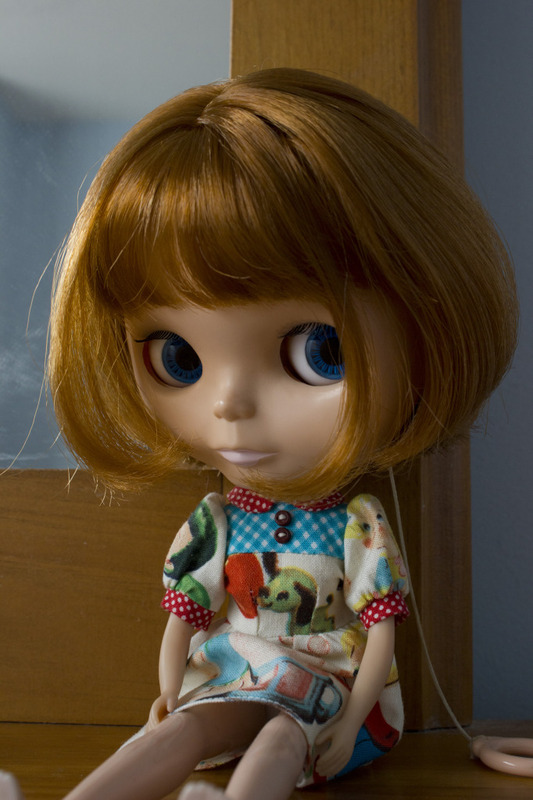 Blythe dolls are also strangely different from one another, even when they are the same doll and same mold. She was unique, I was sure of it. Pocket's second 'For Sale' photo...also not my photo. This one belongs to Jlee. If you are mad, I will remove it. Then she popped up again. I had just made my semi-annual greek letters small fortune. I talked to hubby, he okayed it, and I PMed for her! I was so nervous that she had already sold and I missed her again! She wasn't, and after some pricey shipping from Canada, I had her in what amounted to two days (US Post was shut down for Thanksgiving. I am completely smitten with cute little Pocket. She is fun to dress and photograph (especially b/c she is matte!) and she brings a different element to the 'family.' I think she is even girlier than Fawn. I'm so happy that I wound up with two kozys kozies Kozy Capes!